In an ideal world every kitchen would be a spacious room with plenty of storage and work space. Imagine having enough storage space for all of your things, or having enough counter space to spread out so that you’re not working on top of someone else, or even having room for a few specialty appliances beyond the standard necessary ones that all kitchens need. Wouldn’t that be the dream? Well, unfortunately the world is not always ideal and not all kitchens can have the perfect amount to space to make all those wishes come true. But luckily those dreams don’t have to come crashing down entirely just because a kitchen is on the small side. This remodeled Dallas kitchen is the perfect example of how to create a hardworking and stylish kitchen when space is at a premium. When it came down to it, limited space was not going to stop these homeowners from achieving a great kitchen. The right remodel that incorporated strategic space planning and a fresh design aesthetic would be the answer to their woes. Plus, it didn’t hurt the homeowner’s desire for a remodeled kitchen that some changes to the room were going to be necessary to accommodate a new family room addition that was being built off the back of the room. (You can read more about that project in a previous blog entry). The most important factor in remodeling this kitchen was in redesigning the work space layout. A larger kitchen has plenty of space and options for spreading out major appliances. 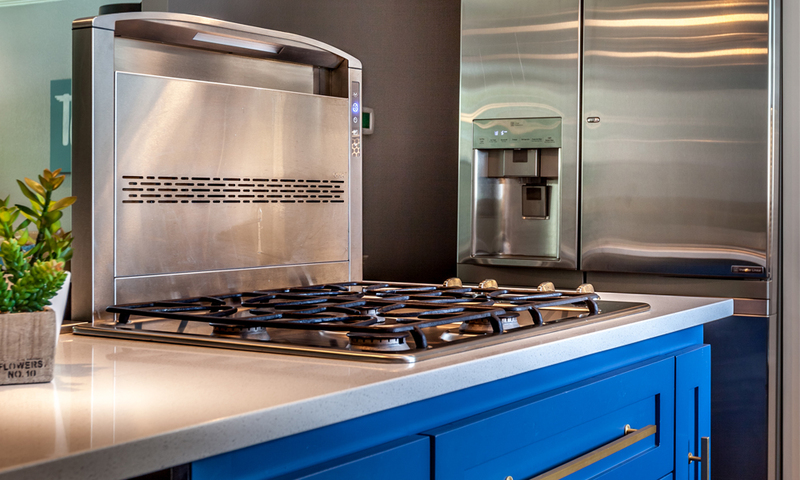 But in a smaller kitchen like this one it was essential to make sure that those major appliances were spaced apart. If the appliances were too close together then multiple users of the kitchen would risk having to work on top of each other. To maximize the room’s effectiveness and to allow multiple users the ability to use the room at one time then the appliances needed to be spread out as much as possible. Smart space planning allowed this kitchen to do just that despite the overall lack of space. The refrigerator anchors the perimeter cabinets on one side of the kitchen. The natural bulkiness of the appliance is partially mitigated by placing it on the fringe of the room. A smaller undercounter beverage refrigerator is located on the other end of the perimeter cabinets and can be easily accessed by anyone using the new family room addition, a main gathering area for the family. Moving the range top to the island provided separation between it and the oven. Instead of installing a venthood above the range top that would have impeded on the line of site an electronic downdraft hood was installed. The hood rises out of the island with the push of a button when the range is in use. The sink’s location did not change in the remodel. Keeping it near the center of the kitchen allows it to be easily accessed from any direction of the room. Another key factor to consider when trying to maximize space in a small kitchen is storage space. When there isn’t a lot of space to work with storage can often be sorely lacking. In this kitchen custom cabinets were designed to provide as much storage space as possible. One key decision was to make all of the lower cabinets drawers. The homeowners wanted to make sure that they could easily access the items stored within their cabinets. So instead of risking things getting shoved behind other items and lost, using drawers makes it easier to access everything that has been stored. Using glass fronts for the upper row cabinets could be considered a surprising choice when trying to maximize storage space. Glass fronts leave no room for forgiveness when it comes to organized storage. But requiring such a high level of organization can also be a blessing in that it not only makes it easier to find things but it can also cut down on all the extra stuff that ends up stored somewhere in the kitchen and promptly forgotten about. The remodeled kitchen has a unique design aesthetic: contemporary with a hint of rustic charm. The contemporary elements are the most prevalent in the room, from the single panel recessed cabinet design to the stainless-steel appliances and to the clean and simple lines that dominate throughout. But the pendant lights over the island and the apron sink bring in elements of country charm and a touch of the more traditional home-y feel. The homeowners used this eclectic mix of the two styles while decorating the rest of the home. Prior to the remodel, the kitchen had featured a very traditional design that did not mesh well with the rest of the home. Carrying the homeowner’s unique design aesthetic over into the remodeled kitchen helped tie the room in better. The mix of whites and blues in the cabinets and countertops also contribute to the mix of styles in the kitchen. Using white cabinets with glass fronts for the upper row cabinets helps to create a more open feel in the room and gives it a more traditional vibe. Their color helps them to blend more with the ceiling and adjacent walls while the glass fronts give them a less clutter-y feel. The lower colors feature a sharp, saturated blue color that is popular in more modern kitchens and complements the design aesthetic of the kitchen and adjacent living areas while providing contrast with the white upper cabinets. The blue and white color scheme is also carried over into the countertops with blue quartz countertops for the perimeter while white quartz is used for the island. The island countertop was also extended along two sides to provide as much bar seating space as possible for the small room. So what do you think? Does size really have to be such a limiting factor in a kitchen or, like in this kitchen, can smart design be used to create a hardworking and stylish kitchen?